Person-centred, Consumer, or Patient Engagement? Person-centred, Consumer, or Patient Engagement are essential for the prevention of and care for chronic health problems. This article offers an overview of the various definitions of engagement; the challenges facing their success; and how people and healthcare providers are enabling engagement with health information technology. People who are engaged in managing their health and healthcare can have better outcomes and lower healthcare costs. In a study of more than 30,000 patients at a healthcare system in Minnesota, Judith Hibbard et al. found that patients with low activation scores had costs that are eight to 21 per cent higher than patients with the highest activation levels. If you Google ‘Patient Engagement’ you will get more than 7.8 million results. Among the results are related terms like ‘Patient-Centered Care’, ‘Person-Centered Engagement’, and ‘Consumer Engagement’. A review of some of the current definitions reveals their commonality. Despite their similarities, there are nuanced differences. For example, the American Association of Retired Persons advocates the adoption of ‘person’ rather than ‘patient’ since it includes the ‘whole person’ beyond the individual’s interaction with healthcare. Population health mirrors this perspective. The World Health Organization estimates that removing the risk factors for chronic disease would prevent at least 80 per cent of heart disease, stroke, and type-2 diabetes; and 40 per cent of cancer cases. This means engaging people before they become ill, which in public health is known as primary prevention. As Benjamin Franklin said, ‘An ounce of prevention is worth a pound of cure’. 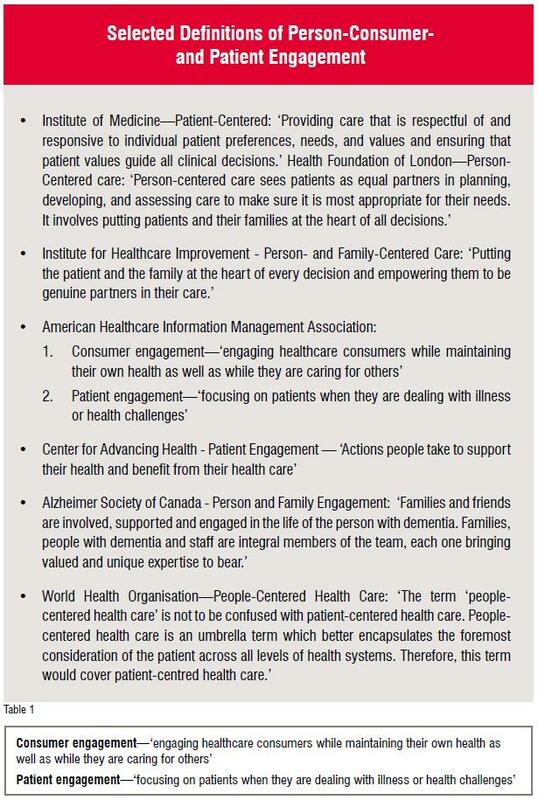 As promising as the terms person-, consumer-, and patient-centered engagement are, they face several challenges. · The health 'system' is fragmented, complex, and opaque. · People live their lives outside of clinical settings. · Stress is high, in part due to many demands on personal, professional, and institutional resources. · Trust and communications between various stakeholders can be suboptimal. · The 'old school' culture—that providers are the experts, and patients should be submissive—persists. · Habit (or inertia for institutions) is a mighty force to overcome. · Language and cultural differences. Patient and family engagement are fundamental to healthcare models such as the Patient-Centered Medical Home and Meaningful Use of EHR. Two of the nine standard categories of the National Committee for Quality Assurance Patient-Centered Medical Home Recognition facilitate patient engagement: Access and Communication and Patient Self-Management and Support. Meaningful Use includes objectives that enable patients to view, download, and transmit their health information and for providers to provide EHR-generated patient-specific education resources. 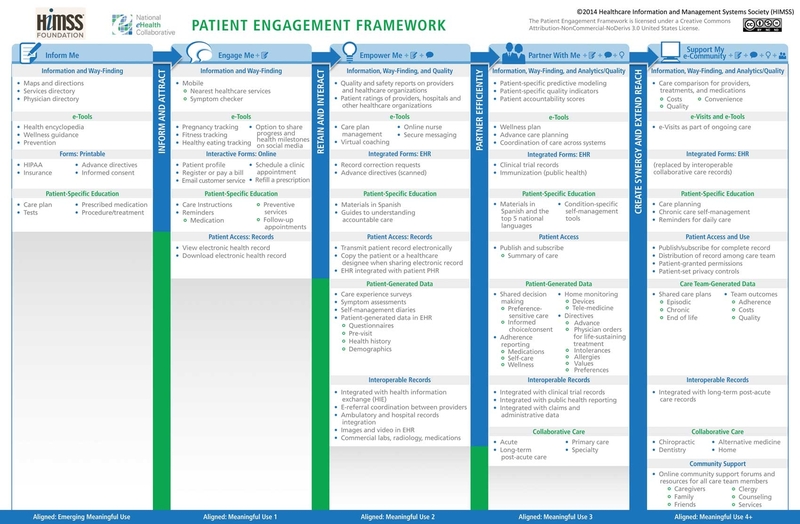 The Healthcare Information Management & Systems Society promotes the Patient Engagement Framework, a model crafted to guide healthcare organisations advancing patient engagement through the use of health information technology. The framework is aligned with Meaningful Use. According to Google’s Mobile Planet, smartphone penetration is growing across the planet. In their 2013 report of forty-seven countries, the average penetration was 44.6 per cent (range 12.8 to 73.8 per cent). Smartphone adoption is growing across many sectors of the population. It may not be surprising that a 2014 Nielsen survey in the United States found that 85 per cent of millennials own smartphones. However, they are not alone. Some 171.5 million people (71%) in the United States own such a smartphone. The proportion of men and women in the US with smartphones is similar (70 per cent and 72 per cent, respectively). Multicultural consumers are adopting smartphones at a higher rate than average in the US Seventy-eight per cent of Asian Americans, 77 per cent of Latino-Americans, and 73 per cent of African-Americans have smartphones. Mobile technology and smartphone applications can promote personal activation by personalising health information technology. The quantified self can track observations of daily living (ODLs) like mood, weight, food intake, and physical activity. The digital health exhibits of the Digital Health Summit part of the 2015 International Consumer Electronics Show grew 40 per cent. Award winning personal technology included a thermometer refashioned as a patch (STEMPTM); a portable device that can capture and report blood pressure, pulse oxygenation, weight, glucose, and temperature to health care providers (@HomeVitals™); the first and only FDA-approved, noninvasive, stool-based DNA (sDNA) colorectal cancer screening test (Cologuard®); and, a mobile health platform that connects patients to the vendor’s doctors by phone, text, and video chat (HealthTap). The most popular health and fitness iPhone apps include 7 Minute Workout; Body Mass Index Calculator; Calorie Counter & Diet Tracker; Cardio-Heart Rate Monitor; WebMD; and Fitbit. Apple’s new iOS8 Health is an application that can coordinate other health and fitness apps that can track heart rate, calories burned, blood sugar, and cholesterol. The application also enables creating an emergency card on the smartphone’s lock screen that can display selected health information like blood type and allergies. 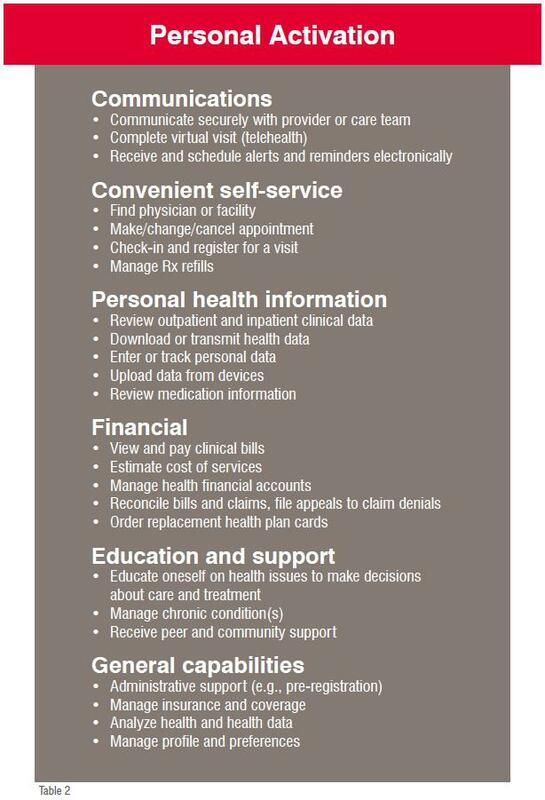 The health data can be configured to be shared automatically with a health care provider. Personal activation improves population health, individual health, and reduces healthcare costs. 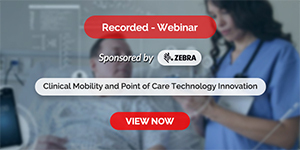 While barriers exist to personal activation, Personal Health Information Technology (PHIT) and healthcare models like Population Health, Patient-Centered Medical Home, Accountable Care, and Meaningful Use of the EHR support address those barriers. 2. Judith H. Hibbard, Jessica Greene, and Valerie Overton, “Patients with Lower Activation Associated with Higher Costs; Depvery Systems Should Know Their Patients’ ‘ Scores,’ ” Health Affairs 32, no. 2 (2013): 216–22. 9. Epgible Professional Meaningful Use Table of Contents Core and Menu Set Objectives Stage 1(2014 Definition) (http://www.cms.gov/Regulations-and-Guidance/Legislation/EHRIncentivePrograms/Downloads/EP_MU_TableOfContents.pdf). Stage 2 Epgible Professional (EP) Meaningful Use Core and Menu Measures (http://www.cms.gov/Regulations-and-Guidance/Legislation/EHRIncentivePrograms/Downloads/ Stage2_MeaningfulUseSpecSheet_TableContents_EPs.pdf).Table of Contents Epgible Hospital and CAH Meaningful Use Table of Contents Core and Menu Set Objectives Stage 1(2014 Definition) (http://www.cms.gov/Regulations-and-Guidance/Legislation/EHRIncentivePrograms/ Downloads/EH_CAH_MU_TableOfContents.pdf). Stage 2 Epgible Hospital and Critical Access Hospital (CAH) Meaningful Use Core and Menu Objectives Table of Contents (http://www.cms.gov/Regulations-and-Guidance/Legislation/EHRIncentivePrograms/ Downloads/Stage2_MeaningfulUseSpecSheet_TableContents_EpgibleHospitals_CAHs.pdf). 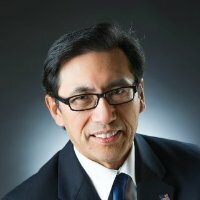 Ken Ong is the Chief Medical Informatics Officer of New York Hospital Queens, an urban teaching hospital serving the most diverse county in the USA and an affiliate of the New York-Presbyterian Health System. He is a member of the Board of Directors of HIMSS.